Kanna Suzuki, along with teammates, Houlfat Mahouchiza and Ester Adinike have been chosen to participate in the 9th annual NJCAA Women’s Basketball Coaches Association All-Star Weekend. The event will be held from July 21-24 in Niceville, FL at Northwest Florida State College. Featuring the top 40 rising sophmores in the country, Suzuki, one of four GCAA players selected, is coming off an impressive Freshman year both individually and as the floor leader for the Lady Jets. Kanna started in 32 out of 35 games and logged the most minutes on South Georgia Tech and fourth most in the GCAA. She averaged 9.1 ppg and also lead her team and the GCAA with 4.8 assists (10th in NJCAA) and 36.7% from beyond the arc, while ranking 3rd in assist/turnover ratio. Suzuki was also named the 2016-17 GCAA Freshman of the Year, helping South Georgia Tech to a testy GCAA Tournament Championship and a second round appearance in the National NJCAA Tournament. Lofty goals are nothing new for the anomaly of the 5’2 Suzuki. For the second year in a row, the Georgia Collegiate Athletic Association Division 1 Women’s Championship was a show-off between Georgia Highlands and the South Georgia Tech Lady Jets. Nationally ranked SGTC (28-4|13-1) trailed the Highlands (19-14|12-2) after the first quarter in a back and forth duel. The Lady Jets dominated the Highlands in both regular season games, but with top scorers La’Deja James and Camille Coleman (ACL injury) gone for the rest of the season, the task of topping last year’s GCAA Champion Chargers was a tough task. The Highlands led a see-saw game into the 3rd quarter before SGTC unleashed a barrage of timely 3 pointers by Freshmen Kanna Suzuki, Marina Balaguer and Sophmore Shaineequah Fluellyn. Fluellyn was aggressive on offense constantly creating a shot for herself in the lane and sinking threes from deep. She led all scorers with 30 points and has carried the Lady Jets as the main scorer since Coleman and James have been out. 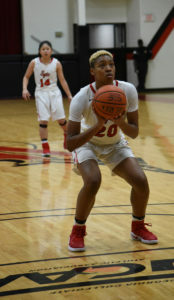 All American Desiree Corbin, also recovering from a knee injury, put in quality minutes although she fouled out late in the 4th quarter along with other big Houlfat Mahouchiza, who hit a key jumper in the 4th quarter to ward off a run by Highlands. Esther Adenike also came up with a big offensive rebound and put back late in the fourth quarter and Fluellyn and Kidd hit big free throws to cement the deal. 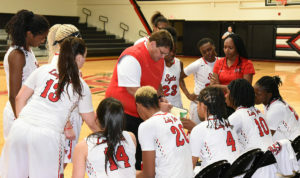 After last year’s nail biting loss to the Highlands, Head Coach James Frey was relieved to get over the hump and not repeat the misery of leading the GCAA all year only to miss the NJCAA tourney. Prior to the game, the GCAA announced several awards for SGTC, with Coleman and Corbin making All Conference 1st Team, Fluellyn making All Conference 2nd Team and Kanna Suzuki bringing in the GCAA Freshman of the Year Award. Coach Frey was also Co-Coach of the Year in the GCAA. The Lady Jets now have a week to prepare for their next game on Saturday 3/11 versus Denmark Tech in District J at 2:00pm. South Georgia Tech continues to impress with its clear hold as the number one team in the Georgia Collegiate Athletic Association, zooming to 18-3 amid conference play in a lopsided 91-39 victory vs. Chattahoochee Tech. A couple of losses earlier in the season bumped the once top 25 program from the rankings, but from the looks of things, Coach James Frey squad may be back in the top 25 next week. Strong play from the team’s sophomores, Desiree Corbin, Camille Coleman and Dejia James has led to a experienced and balanced attack all year. Corbin, an All American last season, continues to dominate as a defensive force, ranking #2 in the GCAA at 10.9RPG and #1 in at 56 total blocks. She is also chipping in 8.9 PPG. Sharpshooter Camille Coleman is currently leading the GCAA in 3PT% at a stellar 47.9% and chipping in 10PPG and 4.4RPG. Repeat GCAA Player of the Week and top scorer La’Deja James is posting an impressive 14.5PPG, 6.1RPG and is #1 in the conference in steals and overall FG%. She is also shooting a conference leading 82.9% from the charity line. 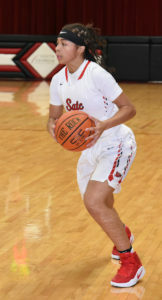 Suzuki has not let down the high expectations and has quickly made a name for herself thus far, leading the GCAA in 3PT made (39) along with total assists (94), while averaging 8.3PPG. Sharing time with other freshman PG, Trakyra Kidd, has had its growing pains, but the two have been forced to grow up quickly and learn to minimize mistakes. The Lady Jets look to extend their record to 19-3 next week as they journey to Atlanta to face Atlanta Metropolitan College on January 28. The South Georgia Tech Lady Jets started their season with an opening home game thriller, topping Chattahoochie Valley Community College on November 1st. With only one returning player and two freshman point guards, South GA Tech used timely defensive pressure and key scores in the 4th quarter to overcome a seesaw battle in front of a full crowd. Down by 5 points with less than 2 minutes remaining, Kanna Suzuki hit a big three pointer to pull South GA Tech to within 2 points. Kanna was soon fouled thereafter and converted the first free throw before missing the 2nd. Fortunately for South GA Tech, Ester Adenike, one of the 5 international players on South GA Tech’s roster, was able to slide in for an offensive rebound and the put-back to lift the Lady Jets by 1 point. The Lady Jets were able to hold on and post a 68-63 win over CVCC. Starting at Point Guard, Suzuki ended as the high scorer for the Lady Jets, tallying 16 points, 4 assists and 2 steals. Head Coach James Frey noted in a pre game interview that Kanna has brought a certain calm to the team and provided a good example on and off the court. The Lady Jets take on IMG in the Lady Jets Tipoff Classic on November 5th and look to keep their winning ways going. After an arduous and difficult road, Kanna Suzuki has officially signed with South Georgia Technical College, a D1 JUCO in the GCAA. The Jets have had notable success over the last several years, with a 27-6 record for the 2015-16 season and milestones of reaching the Sweet 16 and Elite 8 in the last 3 years. Head Coach James Frey noted the excitement in bringing Zoom, as she is known, on board. Kanna missed her entire senior year with an unfortunate ACL injury, but has returned amid uncertainty and landed a full scholarship with SGT. She was a GISA All-State player for Brandon Hall School in Dunwoody, GA, where she averaged 24.3ppg and set school records in points, field goals, 3 point field goals and steals in a season. Suzuki is a shifty PG who can shoot from anywhere inside half court and has excellent vision and IQ.